In its first 24 hours since approved by Apple, Opera Mini for iPhone has been downloaded over one million times. 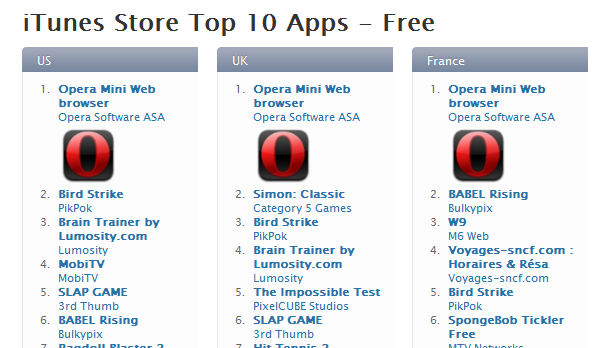 The number was so great that Opera Mini was the most downloaded application across all region app stores. “Today iPhone users have a choice, and, as the numbers show, they are eager to explore new and faster ways to surf the Web on the iPhone – especially during heavy Web traffic,” said Lars Boilesen, CEO, Opera Software. Opera Mini can be downloaded for free for the iPhone and iPod Touch from Apple’s iTunes App Store. Opera have announced that Opera Mini is heading to the iPhone and iPod Touch today, after Apple approved the app for the devices. This comes 20 days after Opera submitted the browser to Apple for approval. “Opera Mini […] enables fast mobile Web browsing by compressing data by up to 90 percent before sending content to the device, resulting in significantly improved page loading. Users of the app will notice an uptake in speed, especially on slower networks such as the 2G Edge network. Surfing the Web with the Opera Mini App on iPhone and iPod touch will also help users save money because of its data compression capabilities” said a press release from Opera. The browser can be downloaded for free now from the iTunes App Store for iPhone and iPod Touch users. IntoMobile have put Opera Mini for iPhone up for a speed test against the iPhones native Safari browser. The results are not surprising, with Opera Mini for iPhone using Opera’s Turbo technology, which compresses data by as much as 90% before sending the data to the iPhone. In the test, the power of Opera Turbo is revealed, with Opera Mini for iPhone killing the Safari browser. You can watch the results yourself in the video below. No word yet on when or whether Apple will approve the Opera Mini browser for the iPhone. 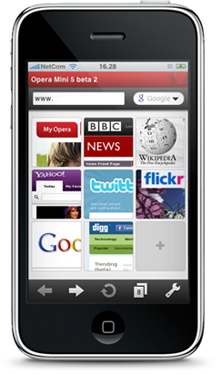 Opera Software plan to preview Opera Mini for iPhone at the 2010 Mobile World Congress. “We are thrilled to offer journalists and partners an exclusive preview of Opera Mini for iPhone during the year’s biggest mobile event,” said Jon von Tetzchner, Co-founder, Opera Software. Such an exercise by Opera could be completely pointless, as Apple may deny the browser entry to the App store as it may compete directly with the iPhone’s version of Safari. “We hope that Apple will not deny their users a choice in Web browsing experience,” Tetzchner told Reuters. Opera also plan on showing other versions of their mobile browsers at the Mobile World Congress which is being held between February 15th and 18th in Barcelona.